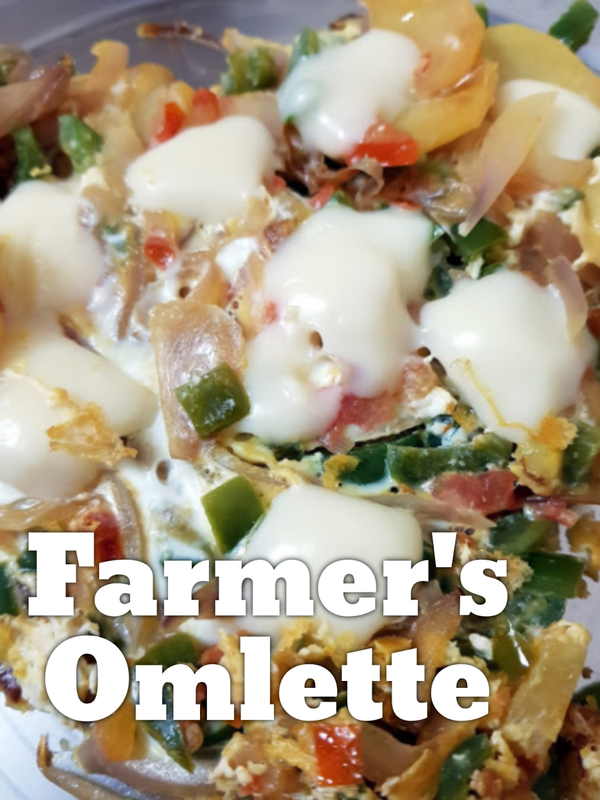 I have been making Farmer's Omlette for years. It is wholesome, filling and very nutritious as a breakfast or snacks. At times, you don't even need a toast to accompany it. 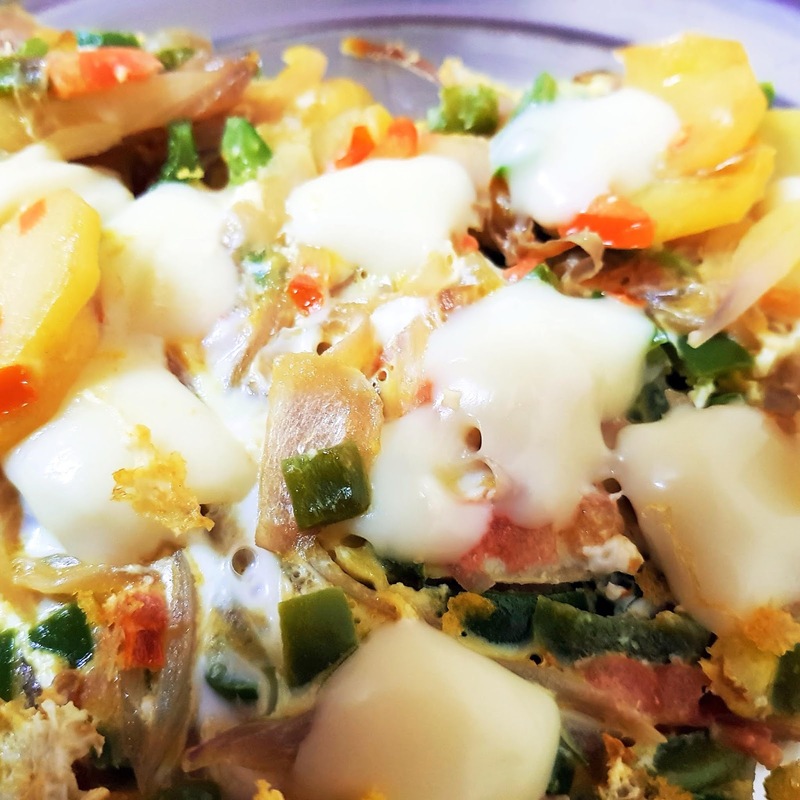 Farmer's Omlette is an upgraded version of the regular plain omlette which makes use of vegetables, sausages, salami and pieces of pre-cooked diced or shredded chicken. Today I am bringing a style of Farmer's Omlette with only vegetables and cheese. Next time I will show how to prepare the same dish with chicken. In a omlette pan, heat some oil or butter. Fry the potato slices and onions together. After potato is semi-cooked, add capsicum, tomato, mushroom and green chillies. The vegetables should not turn mushy or very soft. Each vegetable must retain its shape. Stir and spread the vegetables evenly on the pan. Beat the eggs with 1 teaspoon of salt and pour over the vegetable mixture. Do not stir. The raw egg will seep into the crevices of vegetables on its own. Cut cheese cubes into small bits and spread over the omlette. Switch off the heat and let the egg cook in the residual heat of the pan. Do not flip. The omlette will break. 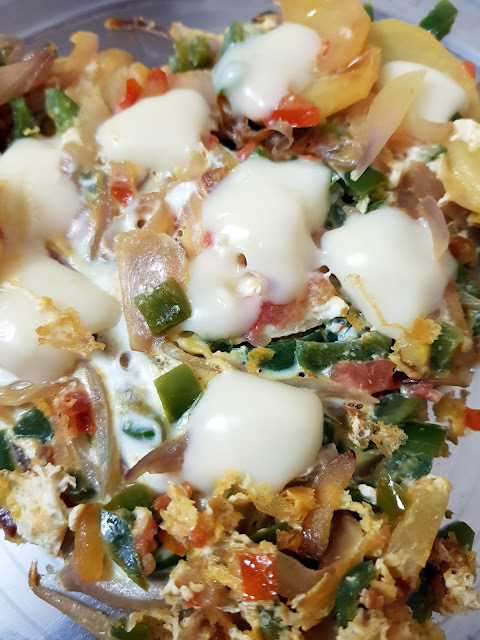 After 10 minutes, uncover and cut the omlette into pizza-like slices. Serve warm as it is or with a toast. Try to prepare this dish in a omlette pan so that the omlette gets a height and resembles a pizza. A normal large pan will not let the eggs set better and when you will cut slices, it will disintegrate. Cheese cubes can be replaced with 1/2 cup grated mozzarella or bits of cheese slices or even dollops of cheese spread.